The last time you painted a room, I can pretty much guarantee that you spent a lot of time and energy trying to decide on the color.Should it be something subtle like a tan or an off-white? Or more dynamic like red, green, or purple? And then … after you pick the basic color, which one of the 30 or so different shades fits best with what you want. Now think about the paint finish. I’m betting that decision was made on the fly. Either you didn’t think about it at all, or your decision was made based on the offhand advice of the clerk at wherever you purchased your paint. But your choice of finishes (aka sheen) is incredibly important. It will determine things like whether the color stands out or fades into the background, and if you have to repaint every time it gets too dirty and/or even if you can wash it. Learning a little bit about each of the different kinds of paint finishes can help you make an informed decision when buying paint and can even help you avoid more work down the line. -Matte or Flat – Got a few small cracks, bumps, or other unsightly features on your walls? Well, matte or flat might be the way to go. Because it doesn’t reflect light like glossier paints, it’s easier to hide imperfections. What’s the negative? It’s not known for washability. If you get scratches or other marks on your walls, you might be forced to cover them with more paint. -Eggshell - A very slight step from matte finish, in both shine and washability, this finish tends to hold up better than matte but not hide imperfections as well. People sometimes use it when they want to give their room or furniture a more rustic quality. The name? Well, that comes from the fact that it has the textural appearance of an egg, of course. -Satin – If eggshell doesn’t quite hold up as well as you’d like, the next step up in shine is a satin finish. Got a room that sees a lot of traffic and wear and tear like, say, your kid’s bedroom? The velvety smooth look of a satin finish can be cleaned repeatedly without harming the paint, but it’s not as shiny and reflective as other glossier paints. 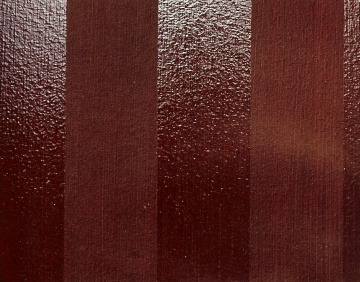 -Semi-Gloss – Generally speaking, semi-gloss is the vanilla of finishes – and I don’t mean that in a bad way. Typically recommended for kitchens, bathrooms, doors, and trim, it gives off a great shine without overdoing it. Semi-gloss will also hold up to moisture (hence its use in the kitchen and bathroom) and can be easily wiped clean. The only thing you need to worry about is making sure the areas you’re going to use it on are smooth and well-prepared. If you leave imperfections, the shine of semi-gloss will only highlight them.